This adaptation of James Follett's 70's post-apocalyptic disaster novel, "Ice," comes from the producers of the 13-part network series, Crusoe and the recent 2-part modernization of Day of the Triffids. It stars Vampire Bill, Stephen Moyer, Sam Neil, and that mom from Spielberg's A.I..
Archer's warnings are ignored, so he heads to the Arctic to find indisputable evidence. Upon arrival, he realises humankind is under immediate threat, and races home to save hisfamily. 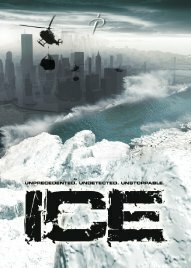 ICE confronts a wholly terrifying and plausible natural disaster of epic proportions. This uncompromising production sees a planet on the brink of annihilation, unleashing an apocalypse with an intensity and magnitude audiences will never forget. Other members of ICE's impressive cast include RICHARD ROXBURGH (Van Helsing, The League Of Extraordinary Gentleman), CLAIRE FORLANI (The Rock, The Diplomat), BEN CROSS (Hannibal, Star Trek), SIMON CALLOW (Rome), PATRICK BERGIN (Patriot Games, Smallville). wow....absurdly obvious rip off of at least 3 movies. 'What will happen to the world without oil!!" I check who's in it before I seen the trailer and surprised that you forget to add SAM NEILL (In The Mouth Of Madness, Omen III: The Final Conflict) here. Just one more example of how Hollywood has completely lost its collective mind and way. When will we stop being bombarded with this sort of unoriginal and unimaginative dreck??? I think this looks alright. The book "Ice" came out in 1978, so I don't really think comparisons to the Day After Tomorrow is valid. Two very different time periods. One was made in the oil deprived '70s and the other was made after peak oil, but in an age where gas prices are still reasonable. I would judge this film on its own, rather than comparing. It's not possible to compare this with filma that tackle a similar hypothesis, before you have even seen the film. I know the Follet novel, and if this treatment of it is as good as the novel, then it should be very good. I liked Day After Tomorrow, but I think there is still some room for coming at the same problem from a different angle. Especially if the science is handled better. AND it's got Sam Neill, so I'll watch it!